Transform your hand a colorful monster with these temporary tattoos. 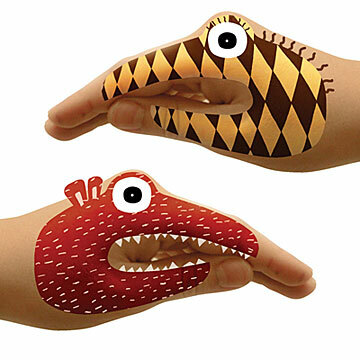 A fun new take on hand puppets, these delightfully designed tattoos transform any hand into a colorful monster. Two sets of eight monsters (each!) includes red, yellow diamond, pink stripe, purple with yellow dots, yellow bands, pink and purple, green and blue. Click here to see the monsters 1, 2, 3, and 4. I bought these for my nieces and nephew. They LOVED playing with them. So cute and inspired creative play. I have a cousin who is in her 20's now but has a silly side to her. She loved this gift and has gotten a kick out of using her new tattoos. Fun for kids and kidults! Brought these to a post-Christmas party and had so much fun - both the kids (10-14) and the adults. I bought these for my nieces for christmas and they loved them. Going to use them for a long car ride. Sweet little monster tattoos! Loved by recipient!